Do you need items removed from your home, managed property, retail or office location? 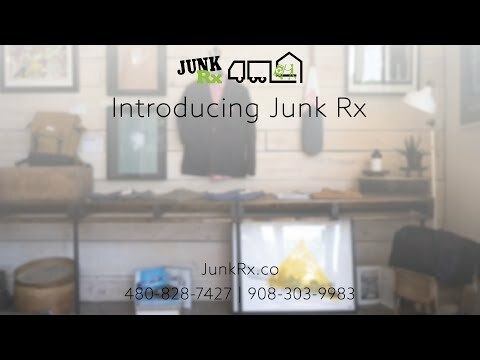 Junk Rx has been serving commercial and residential locations around Washington, New Jersey, since 2001. Contact us today to receive a free estimate on our junk removal services. Whatever you need taken away, Junk Rx can provide you with the junk removal services you need for your home, managed property, or business location! We take just about everything that can be found on a residential or commercial property, ranging from old furniture to construction debris. We haul away items large and small from old appliances and electronics to metal and wood swing sets. Junk Rx specializes in residential cleanouts and property cleanup services, including estates cleanouts, house cleanouts, garage, yard, and any other type of cleanout you can think of! Junk Rx specializes in commercial clean outs and property cleanup services, including for businesses, retail stores and office buildings, retail foreclosures, retail bankruptcies and more! Family owned and operated since 2001, Junk Rx has been providing top-rated junk removal services for residential and commercial properties throughout the state of New Jersey. From commercial clean outs to individual homes, customer satisfaction is our top priority. Not only are we dedicated to providing efficient and helpful service, but Junk Rx is committed to making a difference in the surrounding community; next to recycling junked products, we also support local charities and sponsor a green initiative in our business practices. Whether you’re a property manager needing clean out and junk removal service or a homeowner looking to get rid of some items, the experts at Junk Rx can help. Junk Rx has been family owned and operated for over a decade, and we love to give great deals to our clients for residential & commercial junk removal services. Our NJ junk removal company is partnered with a local, secondhand store, Simply Thrifty, in Washington, NJ. Junk Rx also donates appropriate items as well as to local charities. Common household items that we take include furniture, mattresses, appliances, and electronics. Common outdoor equipment that we take includes fences and decks, pools, play equipment, hot tubs, and even sheds and other outdoor buildings. Our Palmer Township junk removal contractors have the equipment and the expertise to take items that are over-sized or that require breaking down or removing. Such items like refrigerators, old televisions, and old computer monitors may require an additional fee to cover the extra step of removing and preparing the materials for recycling. We make sure that these items are disposed safely. With our top-rated junk removal services in NJ, you don’t have to worry about making a mistake or doing a lot of research to take care of these things properly. The experienced junk removal contractors at Junk Rx will take away a single item or a whole house full of items. We can clear your yard or your property to prepare for a remodel or to make it look good for sale, or we can clear out an apartment or an office to make room for new tenants. Call us to talk about what you need moved and receive a free estimate for your local junk removal services!